Other kids beg their parents for a puppy or a kitten. Not Gracie (well, usually not). My adorable daughter sees saplings on our walks and asks if she can take them home because “little trees are sooooo cute!” This passion of hers corresponds nicely with my newest hobby and brings the whole family together to explore the world of bonsai. I took a beginner bonsai class last month and came home with my very own tree. A week later I took Grace to the Bonsai House in Westland, Michigan, to buy a pot, some soil, and a Ficus Too Little (same plant the one I got in my class). I also purchased my first set of trimming tools (yay!). In the class we were given a short introduction to the tradition of bonsai�we learned about its history, how to pronounce the word (it’s not the word, banzai, which is defined as “a Japanese cheer or war cry,” but rather bonsai pronounced BONE-sigh or BON-sigh), traditional shapes, and some basic potting and trimming skills. All of this I put to good use. Grace used chopsticks to help clear the roots before potting the plant. She filled the pot with bonsai soil and later found the perfect place for a little figurine they gave her at the shop. Both of our plants sit next to each other out on the deck now, and Grace gets to water her tree, when I tell her it needs it. 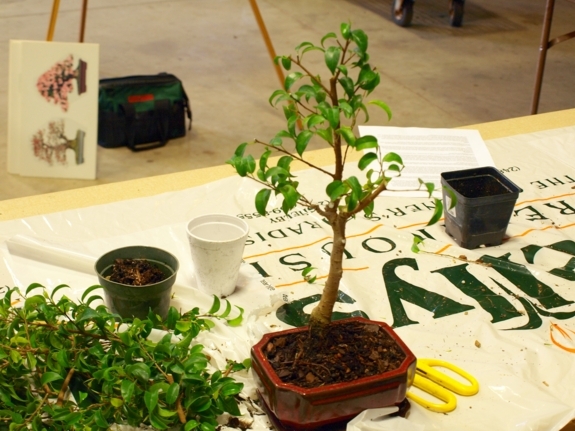 The project gave me a chance to practice trimming my own tree, something the instructor did in our class, and now Grace has a baby tree all her own.When working on the bonsai, we talk all the time about water, sun, and dirt. It’s sparked conversations about how plants grow. While it’s not a puppy, it is a great way to teach kids about nature and how to care for plants.